This past weekend, a few of my coworkers and I decided to drive out to a farm a little ways out of town for an autumnal treat: apple picking. Sadly, it’s the very end of the season, so pickings were slim (or rather, split and attacked by birds), but it was still a lovely outing. We were treated to stunning views of the countryside in an area where the mountains start to roll a bit and the weather was sunny and yet crisp. We arrived at the farm in the late morning to a bustling scene of fall fun. A few children and a few more dogs joined in as we gathered our peck bags and headed up the hill. The best apples were at the very top of the hill, so we were able to kill two birds with one stone and take in the views as well. After a little time scouring the trees for apples that were ripe but not overripe, we adjourned to the bins of harvested apples at the ends of the rows of trees to fill out our bags. As I knew most of my apples would be used for baking, I erred on the side of taking a few of the greener apples from the trees. And Fiancé had joined us as well, making it easier to get some of the higher-up apples. In addition to gathering apples, we also bonded socially, which is something I’ve lacked with my new coworkers, even after being almost a year into my new job. We carried our apples back down the hill and paid for them, along with some cider. After that, we took ourselves to a nearby town for a sandwich lunch and dessert at an adorable bakery. And then home again to consider our spoils. Back home, I found myself tired and busy, so I had limited time to bake this weekend. But I found myself awake on Sunday morning with a desire for something baked and no desire to go out. 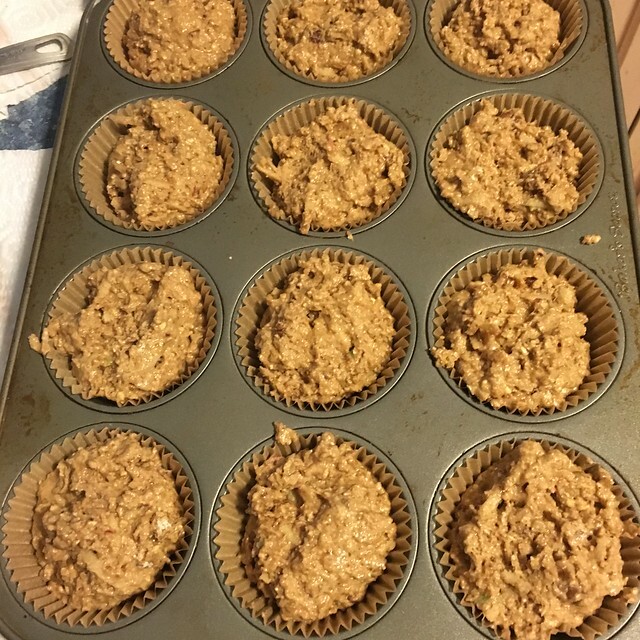 So I had Fiancé grate some apples and set to work baking a batch of Apple Pecan Muffins. 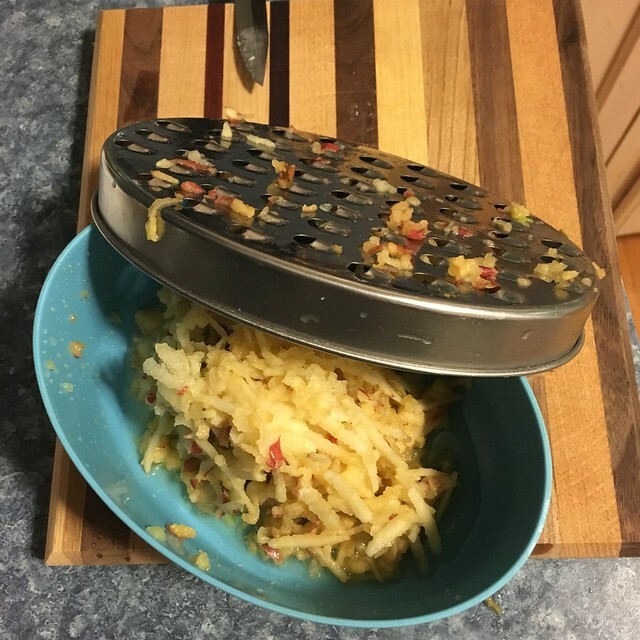 Now, I always grate the apples in my apple muffins because I don’t like biting into big chunks of cooked apple and I find it gives them a nice apple flavor and a moist texture. You can feel free to dice them if you like, though you may need to add a bit more liquid to make up for the juices that won’t release. 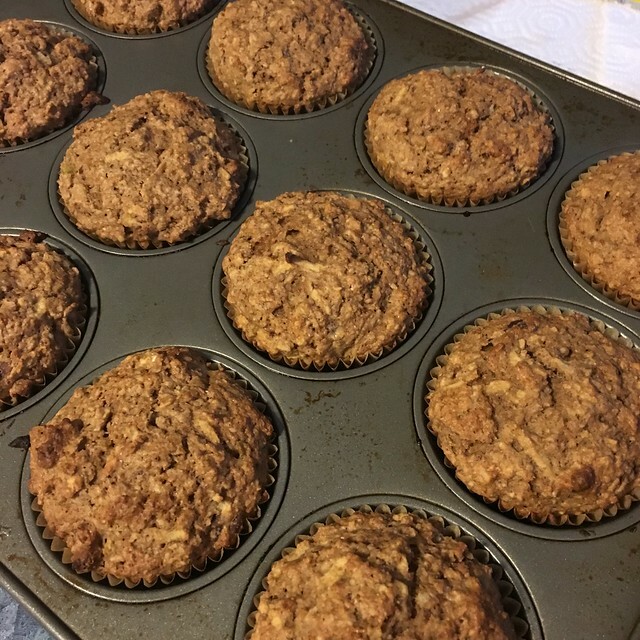 I added pecans to my muffins, as well as more spices than just cinnamon. I have a love-hate relationship with cinnamon. Fiancé likes to quote The Hangover and call me a tiger whenever the subject of cinnamon comes up, which is cute, sort of. But I find that the oft-neglected other fall spices add an almost savory-spice to the mixture. It’s a rather old-fashioned flavor and brings to mind spiced mixtures from the Middle Ages, at least to me. 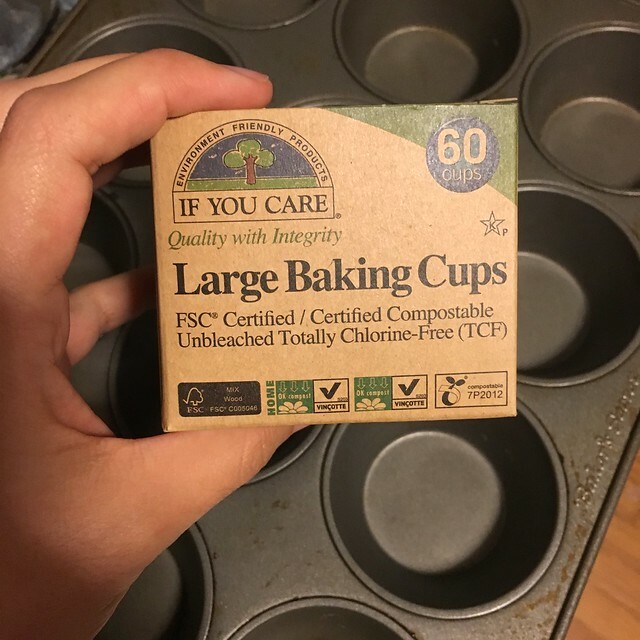 Finally, if you can find the If You Care muffin liners, try them. They are the only muffin liners I’ve found that the muffins truly release from, no spraying needed. 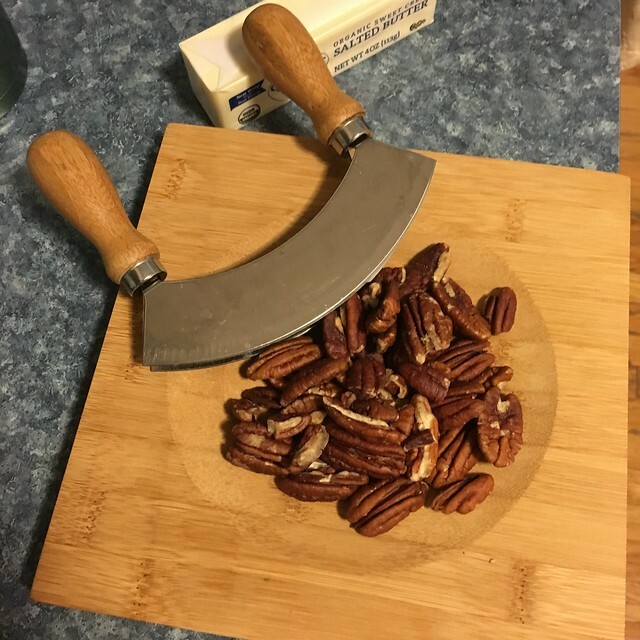 They’re probably easier to find at a hippie natural foods store, which happens to be where I do most of my shopping, but they’re so worth it if you hate having a quarter of your muffin stick to the paper. Preheat the oven to 400 F (200 C) and line a 12-cup muffin pan with paper liners. Spray the liners if you are not confident they will not stick. Or use my favorite liners. Whisk together the dry ingredients, making sure to break up any clumps of brown sugar. In a large measuring cup or a small bowl, whisk together the melted butter, 1/2 a cup of the cider, and the eggs. Really whisk it together to form an emulsion between the cider and butter. 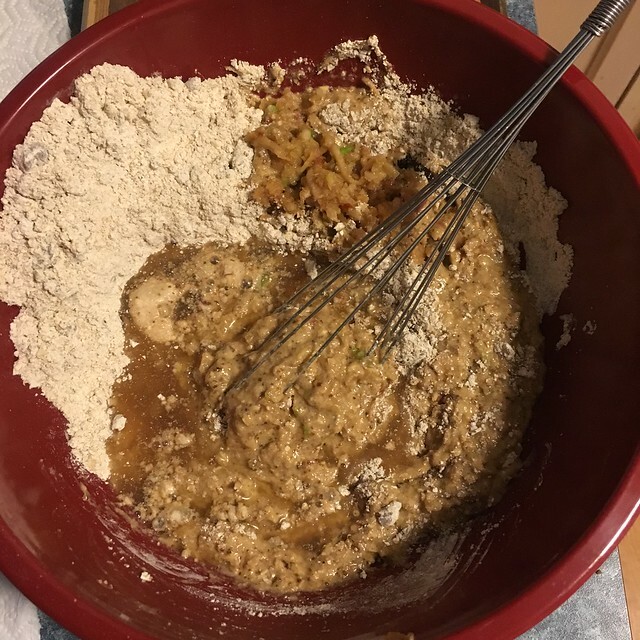 Pour the wet ingredients into the dry ingredients, along with the grated apple, and mix gently. If the batter is a little dry, add the rest of the cider until it’s a good consistency. Make sure you moisten all the little pockets of flour. Spoon into the muffin papers. Your cups will be rather full. Bake for 15-20 minutes, or until quite brown and springy. Cool as long as you can bear it in the pan and then eat, slathered in butter, preferably alongside a cup of tea or a mug of hot cider.